« Ear Infection Treatment: When Does Your Child Need Ear Tubes? Persistent neck pain can be a warning sign of an inflamed thyroid gland. There are in excess of 20 million Americans who suffer in some way from disorders related to the thyroid gland, and those numbers make it a more common affliction than either heart disease or diabetes. Unfortunately, a majority of thyroid disorders actually go undiagnosed and are misconstrued as some other physical ailment which doesn’t require medical attention. This discussion should help you identify when you are truly having an issue with your thyroid gland, as opposed to some other bodily ailment which is causing the symptoms you’re experiencing. The thyroid is an unobtrusive-looking gland only about 2 inches in length, and it lies forward of your throat, just below the Adam’s apple. It has two sides which are referred to as lobes (these are the objects that look like butterfly wings), and they are connected by a strip of thyroid tissue, medically referred to as the isthmus. Most people have this connecting isthmus, but it does happen that in some people the isthmus is missing, and the two lobes of the thyroid remain separate. The thyroid gland is one component of the overall endocrine system, and that system is comprised chiefly of glands which produce and release hormones into the bloodstream, and the hormones are ultimately carried into the cells of the body. To carry out its function, the thyroid uses iodine from the foods which you eat, primarily so they can manufacture two important hormones known in short as T3 and T4. It’s very important that these two hormones stay in balance and do not reach levels which are too high or low. If either of the two hormones is in short supply in your bloodstream, the pituitary gland causes the thyroid to produce more hormones, and when the levels of T3 and T4 are too high, the pituitary gland causes the thyroid to reduce production. 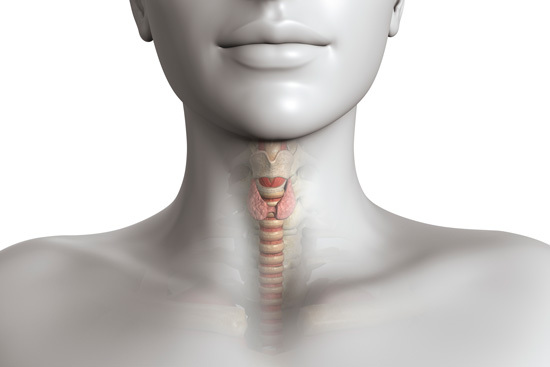 The thyroid gland is located on the front of the neck and partially surrounds the larynx and trachea. sensation of being hot or cold – because body temperature is one of the systems regulated by the thyroid gland, when there’s any kind of disorder in effect, it can interfere with the thyroid gland’s ability to regulate body temperature, which makes you feel hotter or colder than normal. As you can see from the above, many of the warning signs for thyroid gland disorders could very easily be attributed to other malfunctioning systems in the body. In order to diagnose such disorders correctly as being attributable to thyroid problems, it will require evaluation by a skilled doctor who is familiar with the effects of hypothyroidism and hyperthyroidism. This entry was posted by Social Media Team on September 5, 2018 at 11:00 am, and is filed under Ear Neck Throat. Follow any responses to this post through RSS 2.0.You can leave a response or trackback from your own site.